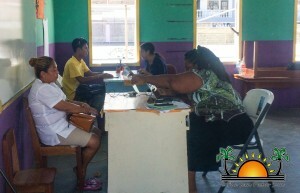 A legal team from the Belize Rural South (BRS) People’s United Party (PUP) was at the San Pedro Magistrate Court on Wednesday, November 21st, petitioning for the removal of 15 persons registered to vote in the BRS constituency. The PUP team argues that those 15 registered electorates do not reside on Ambergris Caye and thus, they should not be eligible to vote in BRS. Defending the electorates was a team from the United Democratic Party (UDP), along with an attorney, who tried to justify the electorates as legitimate residents on the island. Both sides presented their evidence before the Magistrate, and now the anticipated results of the case will be revealed on Wednesday, December 5th, when an official decision will be made. The PUP team gained the services of Attorney-at-Law Eduardo Aguilar, who via a witness presented his findings to the Magistrate. Most of the evidence was based on the allegation that the persons in the objection list were not permanent residents in San Pedro, but simply visitors, as they lived permanently elsewhere on the mainland. UDP’s attorney, Estevan Perrera disputed these allegations and questioned the accuracy of the evidence presented in court. He stressed the importance of providing the court with facts and not unofficial information. Perrera later shared with The San Pedro Sun that the persons raising the objections have not provided the court with any proof or justification to substantiate their claim that any of the persons in the list are not living in San Pedro Town. “We believe that they should not have brought up these objections because they need to be based on facts and not opinions,” said Perrera. Both parties are confident they will win the case.